The history of Apsley House goes back some four decades prior to its purchase by the 1st Duke of Wellington in 1817. The house was completed in 1778 for Lord Apsley, later the 2nd Earl Bathurst, and was both designed and furnished by one of the late 18th century’s leading architects, Robert Adam, for a total sum of £10,000. In the late 18th century, Hyde Park Corner was the very edge of town and adjacent to the house were the toll gates through which anyone entering London from the west would pass. 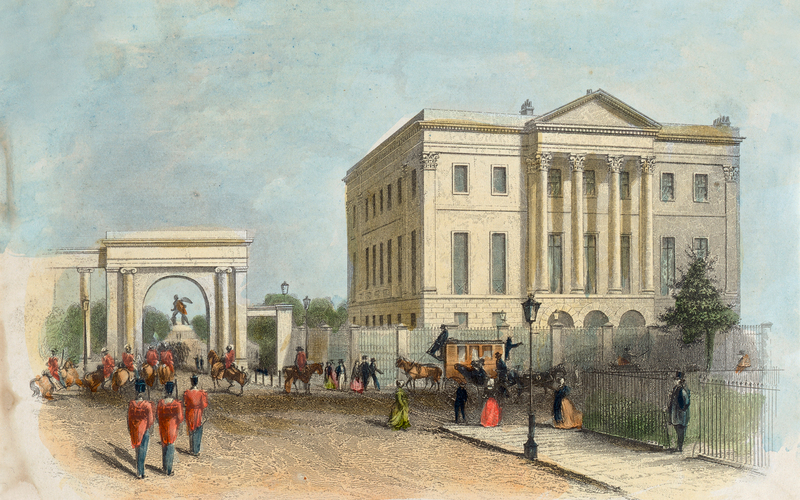 The house’s nickname of ‘Number One London’ was coined at this time as once through the toll gates, Apsley House was the first house a traveller would pass. In 1807 the house was sold to Richard, Marquess Wellesley, a former governor-general of India and the elder brother of Arthur Wellesley who was yet to be raised to a peerage. Having purchased the property for £16,000, he arrived in an almost empty house as the majority of the Adam-designed furnishings had been removed by Lord Apsley. Although Wellesley never extended the house, he did redecorate and buy sumptuous new furnishings, the cost of which totalled around £20,000. Finding himself in straitened financial circumstances after a decade of lavish living at Apsley House, Marquess Wellesley was only too glad to accept when he received an anonymous offer of £40,000 to purchase the property. The bidder turned out to be Wellesley’s younger brother, no longer merely Arthur Wellesley, but now 1st Duke of Wellington and a national hero for his leadership of the allied forces at Waterloo. 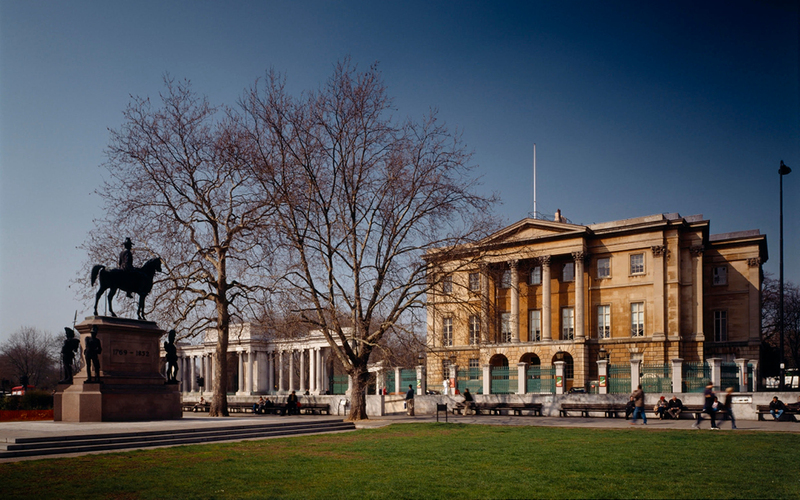 Purchasing Apsley House allowed Wellington to own a house befitting his new-found status. All around Apsley House were the great town houses of some of Britain’s most well-established aristocratic families and if he was to equal them, he needed a grand London home. Wellington already had the country seat at Stratfield Saye, which had been gifted to him from a grateful nation earlier in 1817, and along with that came a fortune of some £600,000 with which the Duke was to build himself a new palace. Plans for ‘Waterloo Palace’ were drawn up and this huge new country house was to be the grand ducal seat for Wellington. Reflecting on the proposals the Duke decided not to go ahead with the palace after all, due to the huge construction and maintenance costs, which he judged would not be able to be met from the revenue derived from the estate in future generations. Instead, some of that fortune intended for the new house was diverted to extending Apsley House. The Duke called in his former private secretary-turned-architect Benjamin Dean Wyatt to complete the first phase of the remodelling in 1819. The first extension took the form of a three-storey addition discretely placed on the east face but far back enough so as not to compete with the Adam frontage. Contained within this new block were an underground stable at basement level, on the ground floor the Duke’s own bedroom suite and immediately above on the first floor was the new great dining room. This grand new room allowed the 1st Duke to begin entertaining on a more lavish scale, and the dining room became the setting of the annual Waterloo Banquet. One of the earliest dinner guests to be welcomed to the new dining room was King George IV. Turtle and venison appeared on the menu in what The Morning Post described as, ‘one of the most judiciously arranged dinners ever seen.’ All through the 1820s the newspapers were littered with stories about the glittering parties and dinners held by the 1st Duke and Duchess at Apsley House; this was a necessity for a man with political ambitions in the 19th century. In 1828 upon becoming Prime Minister, the Duke used the opportunity of having 10 Downing Street at his disposal to move away temporarily and have Wyatt back to further enhance Apsley House. These alterations were to really put it on the map of great London houses.